Vinification 100% new French oak, extra-fine grape selection from the Tronçais forest, aged for 17 months on fine lees Geographic location of the vineyard : Portes des Gorges de l'Ardèche Blend from various high-altitude parcels (300 m) on marl-limestone soil, at the location known as Le Liby, which benefits from a cooler climate. 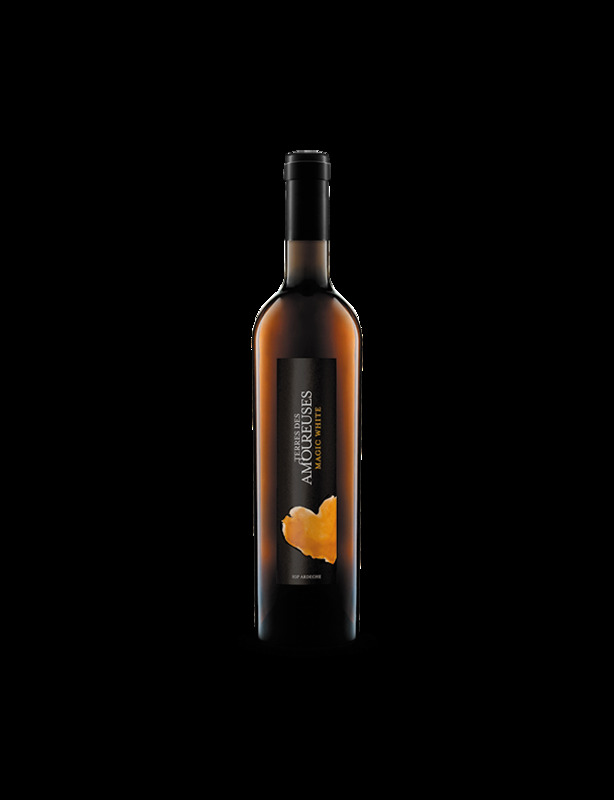 Colour : deep golden yellow Nose : Bright, fresh and very perfumed Aromas : Peach, apricot, citurs, fresh butter, vanilla Palate : Fresh in the attack, very aromatic, distinctive and powerful. Mineral and saline finish and persistence Magic White goes wonderfully with foie gras served on ginger bread, a curried lobster, a bouillabaisse or a Saint Pierre goat's cheese with fresh coriander. On the right bank of the Rhône, at the entrance of the Gorges de l’Ardèche, in Bourg-Saint-Andéol, extends the Château les Amoureuses vineyard, on a land that mixes relative mildness in the north with a true Mediterranean character. Jean-Pierre Bedel, head of the industrial group Fabemi, is a builder with a strong personality, who has always had a real love for the Ardèche land. Naturally then, with his wife, Florence, he bought the Château les Amoureuses in 2011, with the wish to breath new life into it. On the 76-hectare estate, everything was redesigned, from the vineyard itself to the smallest details in the winery: the choice of varieties, how the vine is managed, the vinification process, ageing and blending. In summary, the complete chain of the wine-maker's work. A new process that is resolutely focused on the production of quality wines, reliant on the diversity of the Ardèche terroirs.Thus, a project was born that combined TERRES DES AMOUREUSES (IGP Ardèche creator wines, synonymous with innovation, freedom and audacity!) with the traditional CHÂTEAU LES AMOUREUSES (authentic, elegant AOP Côtes-du-Rhône and IGP Coteaux de l’Ardèche wines).